We always tell our candidates that the key to having a great executive interview is to have a solid foundation of industry knowledge, and a contextual awareness of your future employer. This point cannot be stressed enough. It’s important to go the extra mile when it comes to looking into every aspect of your prospective employer. Do your research on the company - that includes on the individuals who might be interviewing you and those who hold key positions within the company and the department. Aside from the obvious company website, Google and LinkedIn are great resources for this kind of information. You may also want to check out social media channels like Facebook and Twitter plus press releases in the news or on the company’s web page. Consider the latest PR and how the firm’s stance in the market stands to be affected as a result. This will show that you are commercially minded and well up to date of your prospective employer’s situation and where the company may be heading in the near future. Qualify your knowledge with meticulous detail on revenue numbers, key statistics and professional backgrounds of executives. Knowing the company, the industry and competitors will ensure you stand out as an engaged and enlightened candidate. From the moment you submit your application, you can expect your profile to fall under the scrutiny of your future employer. Being on time for an interview is not enough. Turn up at least ten minutes early, if not to give you breathing space, and show prudence. If you are running late, ring to inform concerned parties at the earliest opportunity; dealt with correctly, the issue is unlikely to impact on your performance. Be as courteous to the door attendant and receptionist as you would be to your prospective new boss, this is a good life/business ethic to adopt. 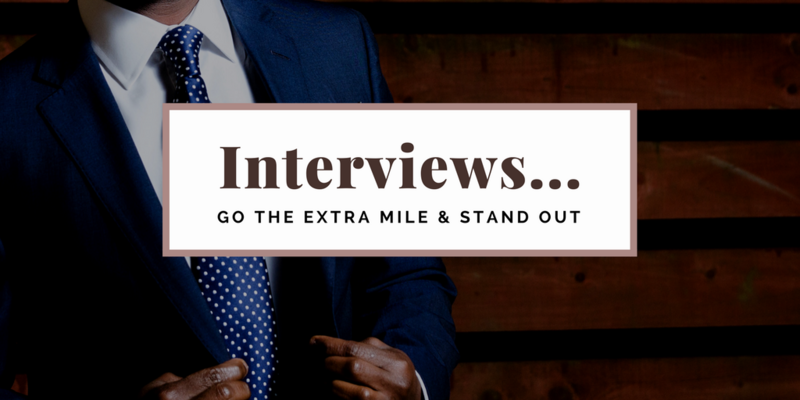 When it comes to entering the interview room, be ready. We all know how awkward it is to juggle an empty coffee cup and your mobile phone as you walk through the door! Keep it simple; this will help focus your mind. What to wear in an interview has been the subject of a previous blog; it’s worth re reading what we recommend. Remember, how we present ourselves is essential for first impressions, even before we have spoken. Our blog explains how to dress appropriately for the industry and position you’re going for. In a post-power suit era, even the stiffest of corporate giants have relaxed dress codes to resonate with the fashions set by fresh, techy markets. Dress codes for more creative positions can have more leeway, but be sure you match the personality set by your apparel. Demonstrate your confidence when you walk into the interview by offering an introductory handshake, this will empower you and show your proactive, can-do attitude. Don’t fidget or play with papers, ladies, don’t play with your hair! Avoid habits like pen clicking or tapping your fingers and try to maintain eye contact. Sit comfortably but don’t appear too slovenly. Research into popular general interview questions will give you more confidence when interview time comes. Be prepared for questions such as, ‘where you see yourself working in five or ten years’ time?’ and ‘how did you manage to find a solution or way out when in a difficult situation at work,’ or an explanation of ‘how you have demonstrated leadership’. Richard Branson sometimes asks interviewees to divulge something that they didn’t have the chance to include on their CV. Such line of questioning allows a candidate to relax and open up a little more; employers can see how you behave when put on the spot. Interviews can be stressful there is no doubt, but there are so many ways to gain your confidence through good preparation. Take encouragement from the fact that your CV speaks for itself and employers want to see you to give you the opportunity to really shine through in a face-to-face meeting. With practice, great presentation and a winning attitude, you have every chance of making employers realise that you are the perfect candidate for the job. If you have any questions after reading this blog, please don't hesitate to contact us.